The petits fours kit makes 16 one-inch petit fours. This kit contains the wooden template for the petit four's body, wool felt for the bodies, pre-cut wool felt for the flowers, pre-cut stuffing, floss, needle and instructions. Everything you need to get started. Our petits fours are sugar free, gluten free, carb free, fat free "confectionary treats" that are high in fiber-fill. So what is a petit four? 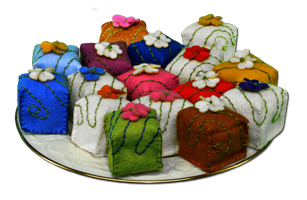 Petits fours are small confectionery treats often served as dessert for an afternoon tea or after dinner with coffee. The edible version is made with layers of sponge cake, filled with flavorful layers of fillings, and generally covered with a smooth draped icing. The term petit four means "small or low fire oven." So, how did a cake-like treat get the name meaning low fire oven? Pre 1800s, most ovens were brick or masonry. Early in the pre-dawn hours, a wood fire was placed inside the oven which heated the mass of brick. The first items baked in the oven required the hottest temperature. As the oven cooled down over a period of many hours, items were baked that needed a lower temperature. The petits fours or little cakes needed a low fire oven as they were both small in size and light in mass making them perfect for the last useful heat from the oven. 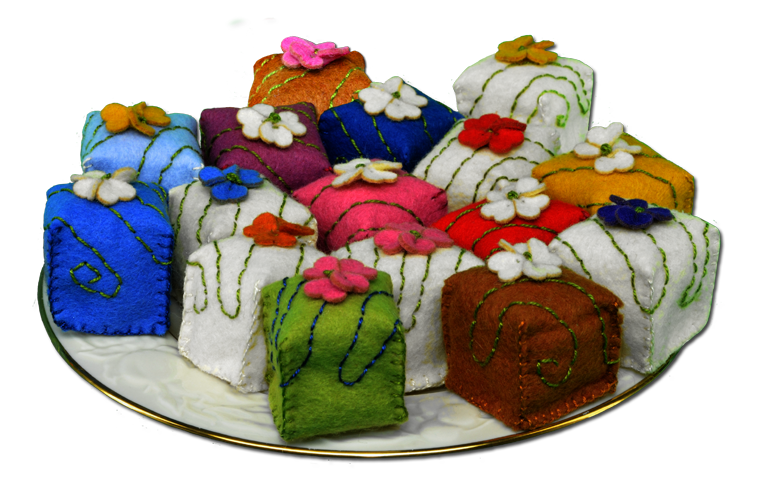 Try our petits fours kit, but remember these wool felt little cakes are not edible, they are for display purposes only. After all who would eat wool and fiber fill?